Instead of wasting the time in a long queue, I had opted to book my ticket online. 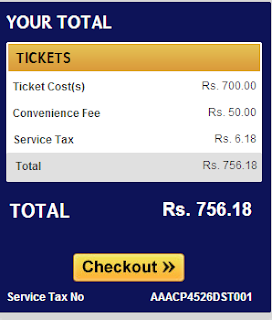 PVR ticket booking can be done easily through the PVR cinema website. PVR booking can be done using Credit Card, Debit Card, Internet Banking and Gift Cards. After booking the ticket the Booking ID will be send by PVR to your email address. You will also get a message on your Mobile with Booking ID. There is no need to take the print out of the PVR Cinema ticket. Go to the PVR cinema according to your show timings, tell them your Booking ID, They will ask your mobile number for verification and give you the printed ticket. 1. Go to the PVR Cinemas Website. 3. Now enter the movie on "Book Ticket" section or select the movie from "Now Showing" section. 4. Select the PVR Cinema where you would like to watch the movie. 5. Select the Date and Show timing. 6. Now select the number of seats and "Class". 7. Click on "Proceed" button. 8. Now enter your Email Address. if you are a registered user then select option second and proceed. If you are not registered to their website then choose first option and enter your mobile number. 9. Now they will display the seat, change it if you want. 10. If you want some snacks then choose from the list. 11. Now click on "Checkout" button to proceed for payment. 12. Now select the payment options according to your choice like - Credit Card, Debit Card, Net Banking, Gift Card etc. 13. After successful payment you will get a mail on your email address and SMS on your Mobile with Booking ID. 14. Now visit the PVR cinema according to your show timing (at least before 10-15 min) and show the Booking ID to the booking counter. They will verify your Mobile Number and give you the printed ticket. 15.Now,Go to the theater and enjoy the show:).